Walking into Freshman Year at UW-Madison, I brought an essential tool with me. One that followed me from high school to college. One that has helped me survive-and thrive-all the way up to my senior year. One that is known as a Nalgene water bottle. A water bottle? All that hype for a stinking water bottle? Yes, I live and love by my resuale water bottle. This little bottle is an indispensable tool for a college freshman (and any student after that as well). From protecting the environment to helping hydrate for long study days, a water bottle is a necessity for any student. The reusable characteristic of the water bottle is just part of its appeal to environmentally conscious students. Having a reusable water bottle offers a saved chunk of time (and money) that would be otherwise wasted chugging water at a bubbler or waiting in line to purchase a disposable option. Hydration is also very important for hard-working students. As a general rule, we are often told to consume eight 8-ounce glasses of water per day. This feat is even easier when students have a water bottle on hand that is reusable and refillable. As someone who drinks at least a gallon of water a day, I can attest that it would be impossible without my Nalgene! 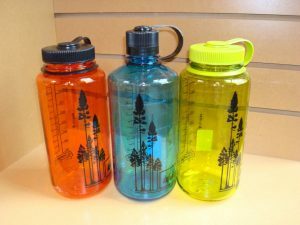 While the Nalgene brand boasts 32 ounces of space in their bottles, there are countless other brands with reusable bottles that would aid students in their success starting freshman year! Explore your options and invest in one today!